Stuart Bingham has won his first ever ranking tournament as he clinched a dramatic 9-8 victory over Mark Williams in the final of the 2011 Australian Snooker Goldfields Open. World number one Williams looked set to win the 19th ranking event of his career as he led 7-4 and 8-5 but Bingham made a stunning recovery to win the last four frames and take the title. “This is without doubt the best week of my life – it’s just an unbelievable feeling,” said 35-year-old Bingham, a professional player for 16 years who has experienced the lows and now the highs of snooker. “This proves the depth in the standard of snooker and shows anyone on the tour can win a tournament if they knuckle down and put the hard work in, that’s all I’ve done. “It will help all professional players and I’ve always said you only get out of the game what you put into it. He had only reached the quarter-finals of ranking events before and had received criticism over a perceived lack of ‘bottle’ in close matches when under pressure. That boiled over this week in a bitter public spat with Mark Allen before and after their clash in the last eight, which Bingham won. But the man from Basildon, who was once ranked 76th out of 90 players, believed this victory was the perfect answer to any critics. “I don’t need to say any more. 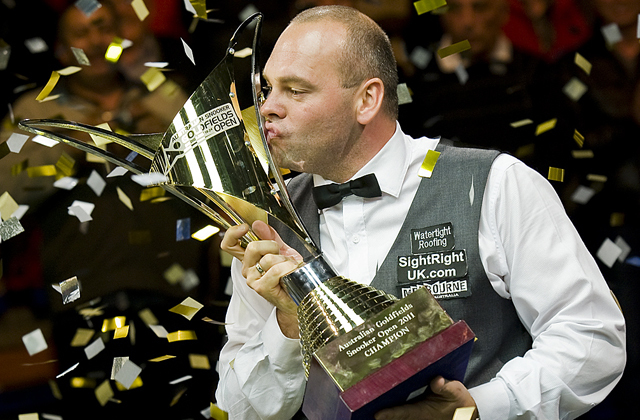 I just have a nice trophy to prove it and $60,000 in the bank,” added Bingham. “I don’t care what anyone says. I have this for the rest of my life and no one can take this title away from me. “Now the hard work comes as I have to live up to being a ranking event winner and now I’m the hunted instead of the hunter. Bingham beat Ding Junhui, Tom Ford, Mark Allen and Shaun Murphy to get to the final and made a sensational start with a break of 139 in the opener and a 3-1 lead at the first break. But Williams made breaks of 89, 85, 57, 84, 52, 52, 71 and 68 as he closed in on victory in front of a capacity crowd at the Bendigo Stadium in Bendigo, Victoria. The turning point came as Williams led 8-5 but Bingham got fortunate with an escape from a snooker that left the Welshman in trouble. “I went 3-1 up but something happened and I switched off,” said Bingham “My potting percentage went down to 20 per cent but I was getting chances every frame. “Mark being such a good player cleared up and took the game. My body language was all over the place and I was slumped in my chair just disappointed. “At 8-5 he had me in all sorts of trouble but the match changed when he snookered me and I got out of it and snookered him – I had hit it and hoped. “My body language changed and I thought ‘this is your chance’. Williams admitted he was shocked to have lost the final. He said: “At 8-5 I was cruising and had him in all sorts of trouble. He managed to get out of a snooker and won it from then on. “Every little flick went his way and there’s nothing you can do about that. I had him perfectly at 8-5 but from then on he played well and deserved to win. “Overall I played quite well and I can’t say I didn’t play well in the final. “I’ve enjoyed it and the crowd has been fantastic. I would like to thank them and everyone to do with the tournament.